The bulbs are peeled, chopped and then blended with grain alcohol (100 proof vodka, a 50/50 alcohol to water ratio which is best for extracting all properties from the bulbs). This is allowed to infuse for three months in tightly sealed mason jars to extract all the healing benefits into the final tincture product. We put it through a tincture press and bottle it in dark brown bottles to maintain the highest potency and freshness. We have a limited quantity of this very powerful Garlic Extract, so it’s “first come, first served’ until the supply is gone! Antibacterial/antibiotic properties – The use of garlic for its antibiotic properties goes back centuries to when it was used to ward off the plague and anthrax. This is directly attributed to the sulfur-containing acillins, which are so abundant in this potent herb. Use as a natural mosquito repellent. A powerful antioxidant that helps fight aging and oxidation in the body. Believed to help lower blood lipid (cholesterol, triglyceride) levels, and is considered an effective herb in the fight against circulatory diseases like high blood pressure and atherosclerosis. Fight acne — use Garlic tincture topically. Soothe ear aches and treat ear infections with garlic oil tincture. Fights fungal infections such as athletes foot. The antiviral properties of garlic may help warts disappear. The recommended dosage of garlic extract for adults is four to five drops of tincture once a day. Tincture can be taken in a glass of water. Use a few drops of tincture topically for treatment of fungal and bacterial infections. Discontinue use if side effects occur. 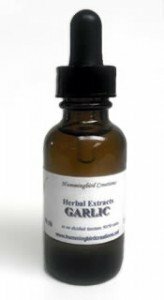 Excessive amounts of garlic or garlic tincture can result in gastric distress such as heart burn or intestinal gas. In extreme cases, damage to the digestive tract can occur. Taking therapeutic doses of Garlic during pregnancy and lactation may cause indigestion. Because of Garlic’s anti-clotting properties, people taking anticoagulant drugs (Coumadin, aspirin, etc.) should check with their physicians before taking Garlic. Those scheduled for surgery should inform their surgeons if they are taking Garlic extract. Because Garlic is hypoglycemic in nature, diabetics and people with low blood sugar levels should always consult their physicians before using. Garlic enjoys the reputation as nature’s most potent weapon against germs, when it comes to fighting infections. For thousands of years, people have used Garlic as a food and a medicine. Along with its antimicrobial, antifungal, anti-inflammatory and antioxidant properties, Garlic also may offer cardiovascular benefits, with its antihypertensive effects. The multitude of sulphur compounds found in Garlic extract are responsible for its effect on blood pressure and each works in a different way to offer protective benefits. Garlic is one of the most valuable foods. It is good for the heart, liver, gallbladder, stomach, spleen and lungs. Garlic Bulb extract detoxifies, even chronic lead poisoning, builds the blood and is an overall great herbal extract. Its expectorant action makes it useful for chronic bronchitis. It has also been used for sickle cell anemia, chronic stomach problems and stomach catarrh. It has been found to be useful with all intestinal infections, such as parasites, dysentery, cholera, typhoid and parathyroid fever. Garlic bulb herbal tincture has been used for atherosclerosis, high and low blood pressure, high cholesterol and high triglycerides. Garlic is thought to be a powerful antibiotic that helps to destroy harmful bacteria and leaves behind beneficial bacteria for the body to utilize as an infection fighter. It also may help to lower blood sugar, aid in weight loss and is said to have anti-cancer properties. Garlic contains the compound allicin, which not only gives its odor but its benefits as well. Research has suggested that Garlic bulb extract increases overall health by reducing cholesterol and blood pressure. One way that Garlic bulb helps lower blood pressure is by promoting vasodilation, or relaxing of the artery walls, so that blood can flow freely without constriction. Other studies have shown that Garlic significantly decreases LDL, or bad cholesterol, while increasing high-density lipoproteins (HDLs or “good” cholesterol). This activity reduces the tendency of the blood to clot, thereby increasing circulation and reducing blood pressure and the risk of arteriosclerosis, stroke and heart attacks. Studies indicate that people who suffered heart attacks, and then took Garlic, had a lower incidence of a second attack. Garlic may also play a role in helping to reduce the risk of preeclampsia and its complications. Garlic helps to detoxify the body. It is said to stimulate the lymphatic system to throw off waste materials. A natural detoxifier it helps to strengthen blood vessels, providing protection against pollutants and heavy metal toxicity. It is believed to cleanse the kidneys and increase urine flow. Allicin is thought to be as potent as pencillin in its antibiotic properties and is important in reducing struvite kidney stones. It stimulates production of nitric oxide and hydrogen sulphide which will relax the blood vessels. This improves the circulation of the kidneys and prevents the formation of stones and the B-6 contained in Garlic may reduce urinary oxalate. It also exerts a diuretic action, which help to flush out small stones. Diuretics cause you to lose water by excreting a greater volume of urine, which can help to speed the metabolism. Increasing metabolism releases fat from the body’s cells faster. This can lead to weight loss. Garlic is considered a powerful anticoagulant that is thought to normalize blood platelet adhesion by reducing the stickiness of the blood and stimulating fibrinolysis, a process in which blood clots are dissolved. This action also helps to improve blood circulation and combat arteriosclerosis. Another benefit of Garlic bulb extracts is that they can help to regulate the body’s blood pressure. So whether you have high or low blood pressure, Garlic can help equalize it. Garlic has been beneficial in ridding the bowel of parasites and is thought to be one of the best choices for killing and expelling parasites such as pin worms, from the human body. It has also been shown to inhibit the growth of Helicobacter pylori, the bacterium implicated in the formation of ulcers in the digestive system (peptic ulcer). This wonderful herb is thought to enhance good digestion by increasing bile production and reducing stomach gases. Garlic is used as an antiviral and antifungal. The activity of the parasitic fungus that is associated with AIDS is said to be inhibited by the presence of Garlic, and the growth of the yeast organism. In a 2008 a study was done at the University of East London, England, and scientists claimed that the killer superbug, MRSA (Methecillin-resistant Staphylococcus aureus). Garlic is considered to be an antioxidant that helps to promote healthy immune system function and inhibit destructive, free radical or oxidative damage to tissues or cells. Garlic is said to strengthen the immune system and build the body’s defense against harmful infectious invasion and malignant diseases. Researchers at Hokkaido University School of Medicine, Japan, claim that treating Helicobacter pylori bacterial infection in the stomachs of people who have been treated for gastric (stomach) cancer and colon cancer and may reduce the risk of cancer from redeveloping. Other research has found that the consumption of aqueous Garlic extract may lead to significant improvement in patients with benign prostate hyperplasia and prostate cancer. The study demonstrated that in the cancer group, significantly lowered total and free PSA values were measured after extract consumption. The results demonstrated that the mass of prostate was found to be significantly lowered after Garlic extract consumption. Urinary frequency was established to be decreased and maximum and average rates of urine flow significantly increased. Garlic is thought to support healthy blood-sugar levels in late-onset diabetes, as it helps regulate blood-sugar levels by tying up the chemical receptors that would otherwise deactivate insulin, the hormone that controls sugar usage and also stimulates the pancreas to secrete insulin. It accomplishes this without stimulating weight gain (a common side effect with certain prescription medications). A study done in 1976 reported from the British medical journal, Lancet, noted that Garlic (and onion) is very hypoglycemic in nature and can lower blood sugar levels in diabetics (people with high or low blood sugar levels should always consult their physicians before using). Garlic is a traditional remedy for earaches. Applied directly to the ear canal, it retards the growth of aspergillus and Candida, two fungi that sometimes cause ear inflammation. 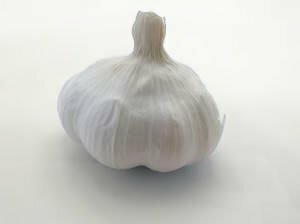 Nutrients: Calcium, folate, iron, magnesium, manganese, phosphorus, potassium, selenium, zinc, vitamins A, B1, B2, B3, B6 and C.
Ingredients: Garlic Bulb, Structured Water, 50% Alcohol.